After a lot of research on the colours and looking at different swatches and eye looks I finally bought the Sigma Creme de Couture eyeshadow palette. It is a gorgeous palette filled with 16 matte fun eyeshadow colours. It is a little difficult to get an all matte eyeshadow palette of such good quality and bright colours so I had to grab this. I bought mine from Rouche Boutique for $38 and unfortunately the Sigma website is all sold out because this was limited edition. You might still be able to find some at smaller makeup websites like Rouche Boutique. This eyeshadow palette is macaroon inspired do the colours have really fun names too. Below are the swatches without a primer. I am amazed by the quality of these eyeshadows. They are creamy and super soft. Blending is very easy using these. I would definitely recommend a primer or a cream eyeshadow as a base to make them really pop. I wouldn't wear this out in public but it was fun playing with the colours. I absolutely love this palette and would totally recommend it. 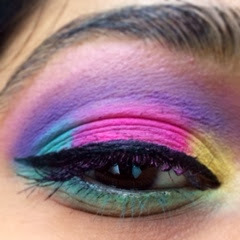 If you want to use only one colour to make neutral eyes pop you can do that too. Matte shades are very versatile and that is why this palette is a must have for me. Do you like playing with colour? Have you got any similar colourful palettes in your collection?? This is such a gorgeous palette, it's really rare to find matte shades with great pigmentation! Great review, lovely, and I love the look you came up with!